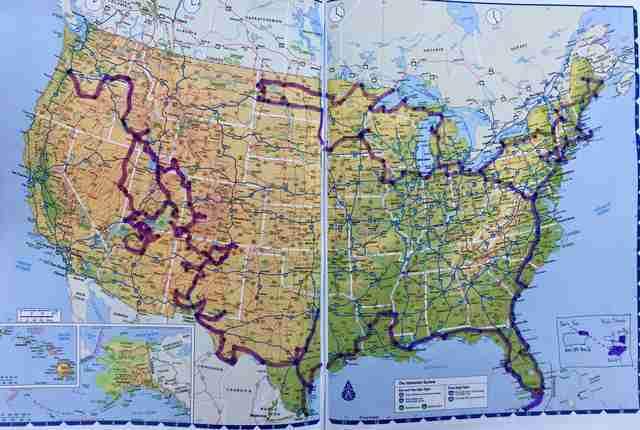 Mikah Meyer has probably driven through more of the country than you have. He's seen all of America's upper Midwest, all of New England, snaked his way down the East Coast to Florida, shot along the Gulf Coast, and eventually made it to Texas, Arizona, New Mexico, Utah, and more. When Thrillist finally caught up with him, he had just crossed the border from Idaho to Washington. A week ago, he was hiking and rafting through the Grand Canyon, and if you visit no other National Park in these United States, he says, you should do that. "Because of the remoteness, there's no cell phone service, there's no Internet" down there, Meyer says. "It's such a rare opportunity to get away from the noise of the world." 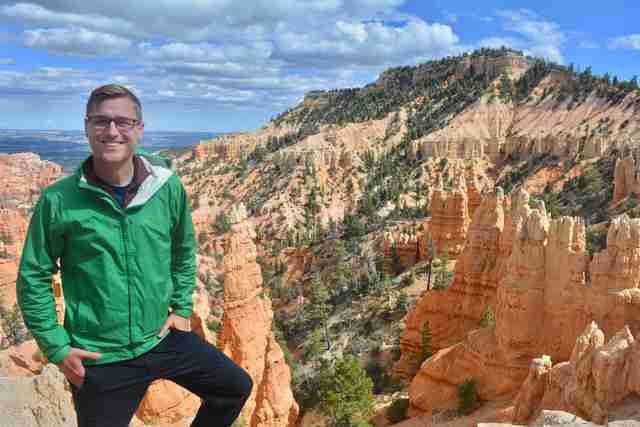 For the last 14 months, Meyer has been road-tripping across the country and through all 417 parks and monuments managed by the National Parks Service, hiking through all of them and sleeping in a cargo van. Along the way he's shared updates on Instagram and on his website, and he's doing it all to both honor his father and to act as role model for those in the LGBT community who are interested in hiking. He's not even halfway through the trip yet. Meyer grew up in Nebraska with a dad who nursed a deep love of road trips. His father loved them so much that he would drive Meyer's three older sisters to and from college any time they needed to get back home. Even his sister who went to college in Delaware got that treatment, which can amount to a full 24 hours or more of driving. For all of his sisters, those trips were essential quality time with their father. That ended with his father's death from cancer on April 29, 2005. Meyer was 19, and not yet in college. He never had a chance to experience that with his dad. "One of my biggest sadnesses is that, because I was 19 when he died, I never got those adult road trips with him," Meyer says. That's what inspired him -- more than 12 years ago and 10 days after he buried his father -- to take his first road trip alone. He's taken one road trip like it every year since then, all to honor his dad. He started this latest one last year on the 11th anniversary of his father's death, during the centennial of the US National Parks. 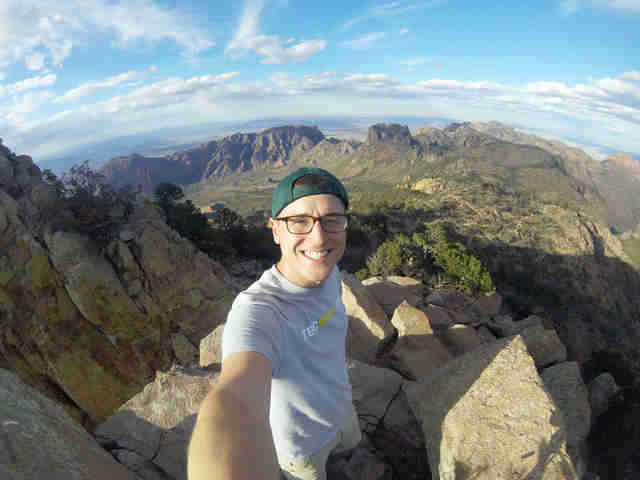 It's a three-year mission, and once he completes it, he'll break the records for being the youngest person to see all the National Parks and the only one to have done it in one continuous trip. "Tomorrow's not guaranteed," Meyer explains, repeating a lesson his dad's death taught him. He knew that when he turned 30, he wanted to take on an especially ambitious trip. For this one, he started it at the Washington Monument in Washington, D.C., and intends to end it exactly three years later, across the reflection pool, at the Lincoln Memorial. It's the hardest thing he's ever done, but he's pulling it off. He's not just visiting the 59 "capital N, capital P, National Parks," but all of America's National Monuments and other protected lands and sites designated by the National Park Service -- a total of 417 locations. "That includes everything from national lakes, national seashores, national monuments," he explains. One key difference is that while Congress has to designate a National Park, presidents can name national monuments. "Many people look at a name and will ignore a park," Meyer points out. "Dinosaur National Monument, for example, is one of my favorite sites of this entire journey. A lot of people don't know about it partly because of its name." Most people immediately assume that Meyer can only attempt a trip like this thanks to an nest egg or trust fund he's got set up somehow. But the son of a Lutheran pastor and a teacher doesn't travel with those luxuries or a safety cushion. 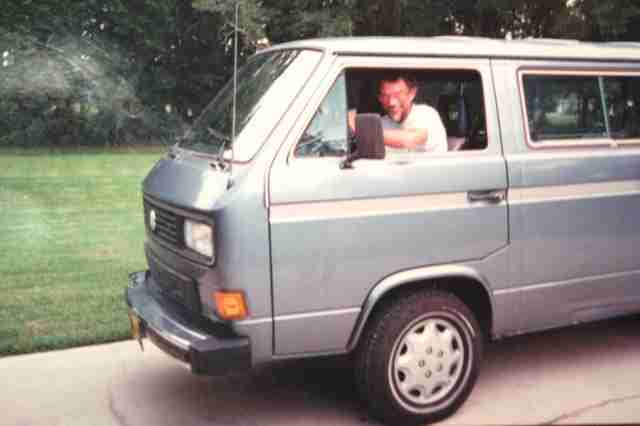 He's drives a cargo van he converted himself. He sleeps in parking lots because campsites -- even at less than $20 a night -- still cost money. "Every day I wake up and I wonder if I have enough money to keep going," he says. That frugal ethic defined both his lifestyle on the trip as well as his route. He strategically follows the temperate climates that he can, both because otherwise the parks he visits will be snowed out or he won't be able to survive a night in a car that isn't heated or air-conditioned when it's not moving. He learned that lesson while "stealth camping" in a parking lot in the Northeast last September. He didn't trust the area, so he couldn't roll the windows more than a crack, making the car too hot and humid to sleep in. The reverse happened two weeks later, in Millinocket, Maine, where the heavily forested area he was staying in got bone-chillingly cold, even in early fall. "I've basically figured out that if it's above 68 degrees at night it's pretty much impossible to sleep, because it's so hot in here," he says. "And if it's below 28, no matter how many sleeping bags or blankets I put on, it's just too cold." Meyer's best travel advice, he says, is to go to places that scare you, and he inadvertently made good on that while hiking through Grand Teton National Park. "I was about 20 yards away from a bear cub," he says. And that made the mama bear mad. "I handled everything wrong. I ran, I thought the bear was chasing me, and I survived, but I thought I was like Katniss Everdeen -- in the middle of the wilderness, unsure of any danger at any moment." Since then, he's done more research on the potential wilderness hazards he can encounter, and "wised up and bought bear spray." But he still visits parks with bears, and in fact is most excited about visiting the 23 parks in Alaska -- some of which have polar bears and grizzly bears. "I've learned that I'm a lot tougher than I thought." Meyer is up front about the emotional and physical toll that a trip like this takes and says, "It's the most stressful thing I've ever done in my life." When Thrillist contacted him and asked where he was in his journey, one of the first things he pointed out was the fact that the previous day, a passing truck had inadvertently flipped a large rock off the road that struck his windshield, leaving a growing, almost 2-foot crack that he needed to get repaired, somehow, some way, when he hit Walla Walla, Washington. Despite the setbacks, he persists: "Whether it be the beauty and splendor of the parks or the feelings of accomplishment I get knowing that I'm doing something to create a new LGBT role model, that I'm inspiring other people, it always just fuels me to keep going." Taking the rainbow flag 🌈 from the border with Mexico to the top of Texas! Meyer characterizes his identity as a gay man as a core part of his journey. 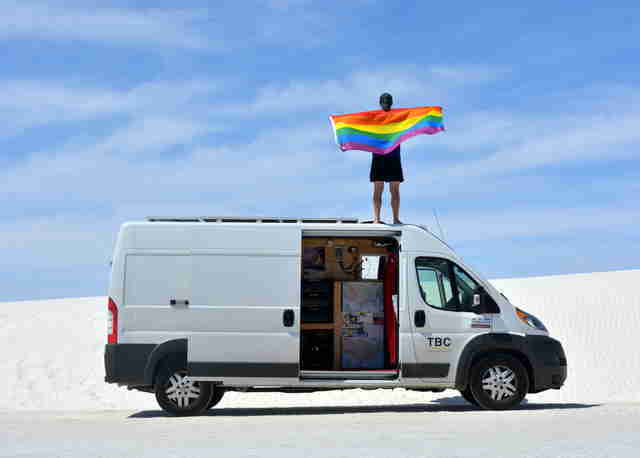 He points out that there are no outdoor companies sponsoring LGBT people, a lesson he learned after reaching out to several of them when he first started his trip. And he found few stories in outdoor publications about anyone in his community. "Apparently, they don't think there's a market there," he laments. "Apparently, they don't think that the LGBT community is interested in this." He points to a media narrative, especially pervasive in the rural areas of states like Nebraska where he grew up, more likely to characterize his community as "all drag queens" or wearing "Speedos on floats." And obviously, if you happen to be gay and happen to love road trips and the outdoors, it doesn't have to be that way. "For me this is an opportunity to be that role model that 10-year-old Mikah in Nebraska never had," Meyer says. "It's so important that we show not only that LGBT people can be ordinary, but that we can be extraordinary." Early on in his journey, he started out trying to get funding to support himself. Companies didn't want to sponsor him, though, whether it was because he was gay or because he didn't have an established social media following, he says, and crowdfunding returned far less money than he expected -- no matter how many times major news outlets did stories on him or local newspapers put him on their front page. One former boss gave him an idea: sing for your supper. Meyer has sung professionally with the National Cathedral's choir in Washington, DC, and his father was a Lutheran pastor, so it's a logical fit. He passes through towns on his travels and frequently stops by their churches to tell his story, sing for their congregations, and receive donations if the faithful feel charitable. Remarkably, it doesn't stop there, either. "I started doing that, and all the churches started asking me to preach," he says. "As this pastor's kid who swore he'd never become a pastor, I now find myself every Sunday -- literally -- in a pulpit preaching." In that forum, he talks about how he struggled with that his belief -- well into his mid-20s -- that he'd go to hell for being something he didn't choose, growing up gay and Christian generally, and specifically the intricacies of growing up gay as the son of a major religious figure in his region. If representation is a thorny issue in the popular media, it becomes exponentially more dire when it comes to religious groups who don't accept gay people for who they are. Meyer's mission is to teach that acceptance. He also can't help laugh while talking about it. It's not only become another way to educate and inspire people interested in his trip, but also a weekly reminder of why he's doing it in the first place. It makes him think about his father constantly. "I know my dad is in heaven laughing so hard," he says. "Because he's like: Gotcha!"